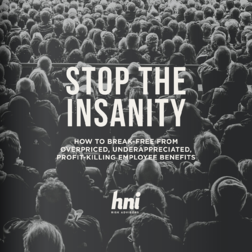 Health care insanity, as we define it, is the helplessness that most employers feel around their health care spend. Each year, they hope it will get better. They try to implement programs to make an impact (wellness, biometrics, etc.). At HNI, we faced this problem as well. We were doing all the right things. We held free biometric screenings at our offices. We gave incentives for wellness participation. We added a workout room in the office. And we were named one of America’s Healthiest Companies. It seemed that we had it covered. Until it became clear that all that stuff didn’t make a difference when it came to our renewal premium. In spite of our efforts, we experienced what so many other American employers experience each year: a punch in the gut. We received a 28% year-over-year increase in our health insurance premium. We are not going to continue to participate in a broken system. We are not going to tout ideas and short-term tactics. We are not going to close our eyes and hope for the best. We are not going to ignore the 5-year impact of this problem. And most importantly, we aren't going to let our clients do any of these things either. Up until now, we've been working behind the scenes to leap ahead of the traditional tactics that we've become accustomed to. We’ve brought in industry experts, lured away top insurance company executives, stress-tested our ideas with nationwide experts, doubled the size of our team, and designed a collaborative workshop to help leaders build a multi-year health care strategy. We don't have it all figured out. But we know one thing: this is better than the status quo. Starting today, we're looking for the next 10 companies to join us on our mission to Stop the Insanity. The commitment is simple. We require a level of commitment and involvement from the C-Suite that is likely more than you're used to. We require accountability for making progress - both on our side and yours. And we require a multi-year outlook so we can truly take back control. 10 spots just opened up. Will you fill one of them?